Obesity in pets has become an increasing problem in recent years, with almost 50% of the pet population being overweight. Carrying all this extra weight can cause a multitude of health concerns for pets, including arthritis, diabetes, heat intolerance and increased pressure on the heart and lungs. To try and tackle the plus size pet population we offer free nutritional consults, with two of our specially trained veterinary nurses, Charlotte Barker RVN CertVNECC and Laura Sandall RVN. Both nurses have many years of experience and have managed to lose 100s of kilos from many pets! Many owners understandably are very apprehensive about coming along to a weight consult. Our aim is to put both you and your pet at ease. It often becomes an extremely positive experience for your pet as they gain confidence about coming to the practice, because in these consults they just get lots of love and attention while you and the nurse do the talking! When you are booked in for a weight consult, it follows a fairly routine pattern, we discuss what food your pet is currently getting, including any treats or extras they may get. 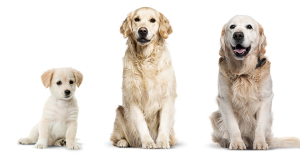 This is very important as it allows us to understand why and how your pets weight has become an issue, and also helps us to work the new regime around what you already do and what suits you and your pet. Once we have discussed all of this, we may alter the amount of the current food your pet is getting, or we may suggest a diet specific food for weight loss, this is often the Hills Metabolic diet. Once you are set up with your new food, or new feeding guidelines for your current food, we ask that you come back monthly so that we can weigh, measure and monitor your pets weight loss. This allows us to ensure that they are losing the weight in a healthy and stable way and also allows us to tweak any issues you may have as and when they come up! The Hills Metabolic food that we often recommend is a fantastic weight loss tool, as it doesn’t just offer a lower calorie diet, it contains many features that help get the weight off and keep it off, while keeping your pet happy and satisfied. Hills have formulated it to work with your pets metabolism, increasing the fibre content to help keep your pet feeling full between meals. There are also specific blends available that contain joint support supplements (for dogs), or urinary and stress supplements (for cats). The lovely little dog featured in this photo is Lottie. Lottie came to see Charlotte in January 2016 as the vet was concerned about her weight. Charlotte started her on the Hills Metabolic mini diet, and after nine months Lottie had lost over 25% of her body weight and is now a perfect healthy pup! 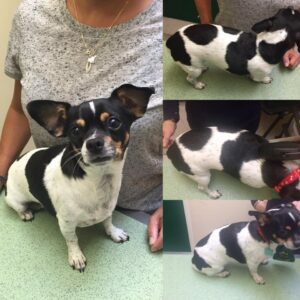 Lottie’s owner also reports that she is much more active, bright and happy since losing the weight. Charlotte still sees Lottie every few months just to ensure that all the hard work stays and she maintains her new slim figure! Our nutritional consults are available with Charlotte on a Wednesday between 10am-6pm at Walnut Tree, and between 3.30pm-4.30pm on Thursdays and Fridays at our Willen branch, and with Laura on a Monday at Walnut Tree between 9am-4.30pm, and on Tuesdays between 3.30pm-4pm at our Willen branch. 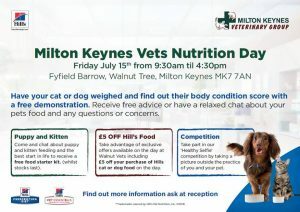 If you have any questions about the nutritional consults or would like to book your pet in to see us, please do not hesitate to contact us. Dietary Dilemmas- let us help you fix them!